If you’re a fan of Mad Men, you’ve probably heard that the next season won’t be airing until early 2012. In the interim, I thought it would be fun to look at sewing patterns from the period covered by the series so far: the first half of the sixties. Mad Men seasons 1-4 have covered the years 1960 to 1965, and costume designer Janie Bryant’s meticulous work on the show has brought a lot of attention to early sixties fashion. Starting next week I’ll be presenting a multi-part series featuring the best of early sixties designer patterns. This week’s introductory post is devoted to context on the show and my personal references for early ’60s glamour. Don (Jon Hamm) and Betty Draper (January Jones) in “5G” (Mad Men, Season 1) Image via AMC. Claudia Cardinale on the set of Fellini’s 8 1/2 (1963). Image via corriere.it. Anouk Aimée in Fellini’s La Dolce Vita (1960). Image via Le Répertoire. 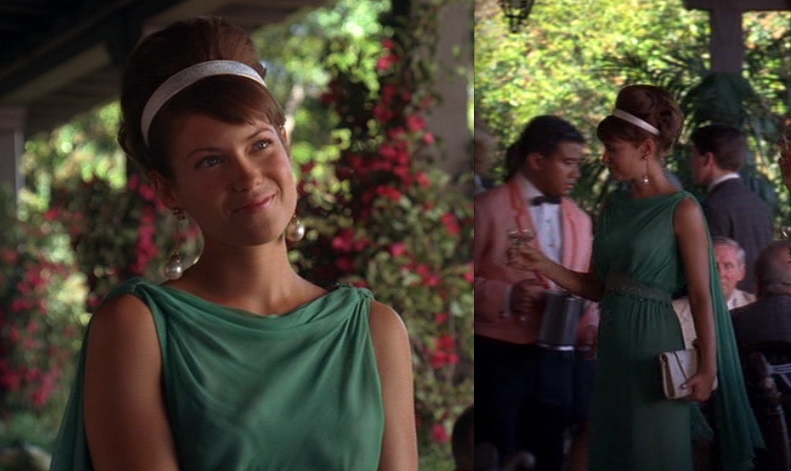 While Betty’s Roman look is a costume for a game of role-playing, Joy’s green dress in “The Jet Set” (Mad Men, Season 2), pictured at the top of this post, conveys serious glamour without a hint of dress-up. (This despite the dress’ being weighted with symbolic significance. Within the season’s network of references to Henrik Ibsen’s Peer Gynt, Joy seems to be a figure of the Green Woman, the daughter of the Mountain King—see discussion here and here.) With its Grecian lines, embellished waistband and floating shoulder panels, Joy’s green dress is my favourite from the series. I’m very curious about the model(s) for this gown (circa 1962)—I haven’t been able to find anything like it online. In interviews, Janie Bryant has described the variety of methods used by Mad Men’s costume department, including designing from scratch, renting costumes, and reworking vintage garments. (Read a New York Times magazine interview here; read the Vanity Fair interview here.) Some of the costumes were also made using vintage patterns purchased online. I wonder which ones? Oddly, the Ungaro is also shown in green..